SWANSEA'S inability to take their chances left them still awaiting their first Barclays Premier League goal and win after drawing with Sunderland at the Liberty Stadium. 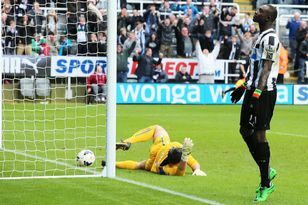 Record signing Danny Graham headed their best chance wide when unmarked inside the box, while the striker forced two fine saves from Simon Mignolet and Scott Sinclair stuck the bar. The Black Cats, also without a win, threatened through Asamoah Gyan early on but he fluffed their best chance when he miscontrolled a Jack Colback pass, while debutant John O’Shea hit the bar. The summer signing from Manchester United had shaken off a hamstring problem to give manager Steve Bruce a timely boost, while Craig Gardner made a first league start. Kieran Richardson and Ahmed Elmohamady dropped out of the side, while captain Lee Cattermole made his 150th Premier League appearance. Swansea boss Brendan Rodgers named the same XI that lined up against Wigan last weekend as both sides looked to bounce back following midweek Carling Cup disappointments. O’Shea almost opened his Sunderland account inside two minutes as he headed against the bar from a Sebastian Larsson corner, while Gyan fired wide after neat play by the Sweden international. Sunderland’s positive start continued as Swans goalkeeper Michel Vorm was forced to make a smart stop to deny Gyan in the 13th minute after Stephane Sessegnon had played the Ghana striker in. Vorm was called into action again when a Steven Caulker backpass sold him short, and the Dutchman excelled again as he put in a well-timed tackle on Gyan. But Sinclair came so close to giving Swansea a 24th-minute lead as his 25-yard strike came back off the bar with Mignolet beaten, before Nathan Dyer headed narrowly wide. Sinclair’s strike ignited a period of Swansea pressure and it took a superb Wes Brown block to deny Graham from an astute Leon Britton pass. The game had been simmering thanks to a series of niggly fouls and the first genuine flashpoint arrived as Cattermole went down holding his face after a tussle with Kemy Agustien, but referee Mark Halsey took no action against the Swansea player despite replays suggesting an elbow had caught the Black Cats midfielder. Graham then missed the best chance of the half as he headed wide from inside 12 yards with the goal at his mercy. Swansea picked up where they had left off with Dyer shooting over after Graham had disrupted the visitors’ efforts to clear. The former Watford man was soon involved again as, from a deep Neil Taylor cross, he saw his header diverted wide by Mignolet. The Belgian goalkeeper then did just enough to deny Ashley Williams a free header as the pressure increased, while Graham curled wide from a Wayne Routledge through ball. The hosts could easily have been punished as an incisive Sunderland break found Gyan in acres of space, but the outstanding Vorm was again up to the task. The busy Graham shot straight at Mignolet while Sinclair blazed wildly over as the hosts desperately sought a winner. But they could not conjure up a goal in a frantic finale and will face daunting trips to Arsenal and Chelsea after the international break. IT is a long way to south Wales, for this. Seven hundred miles in fact. SUNDERLAND goalkeeper Simon Mignolet is warning his team-mates not to underestimate Premier League new boys Swansea City.